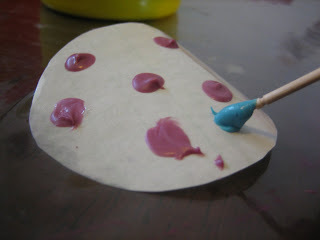 This is a fun and easy way of making a cupcake, cake or anything for that matter look good. 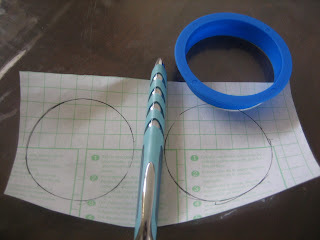 a) What you do is trace around a cookie cutter the size of the cupcake on the back of contact (what you use to cover kids books with) and cut out the circles. 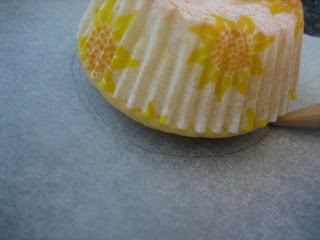 b) If you don't have a cutter the size you want you can trace around your cupcake. 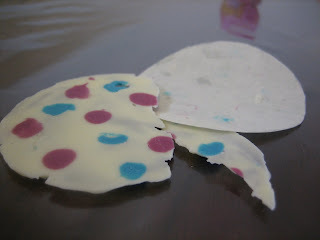 c) If you don't have contact you can use parchment paper but i've found that sometimes the chocolate can slide right off the parchment paper. 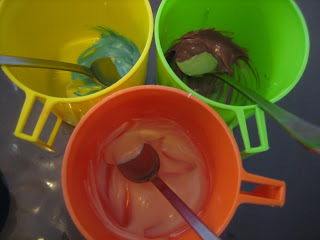 b) Divide the chocolate into three cups and tint one cup blue and one cup maroon leaving one cup white. c) I used chocolate colouring which I bought at Spotlight and Kitchenware Plus at Loganlea (South of Brisbane). I'm not sure how gel or liquid colourings would go. Does anyone know? 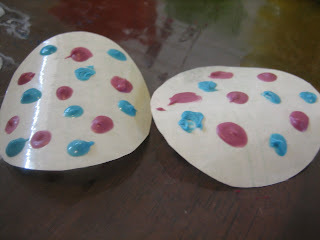 a) I used a toothpick but you can use piping bags to make dots on the shiny side of the contact. b) Don't worry if the contact goes curvy. 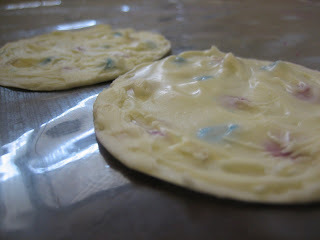 a) At this point the white chocolate should be cool and not hot. If by chance the chocolate has gone hard put it in the microwave for only a few seconds. Wait for it to cool. 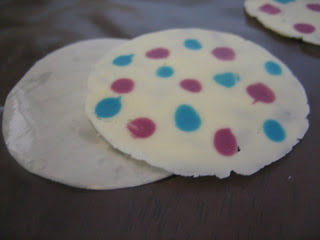 Now spread the chocolate over the whole circle. a) I thought that the topper was firm enough to peel but this is what happened. 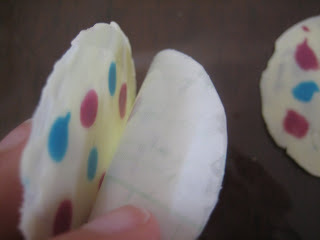 b) So I then put my toppers in the fridge for just one minute so that it gets hard enough to make it easy to peel back from the contact and it worked. c) The end product. 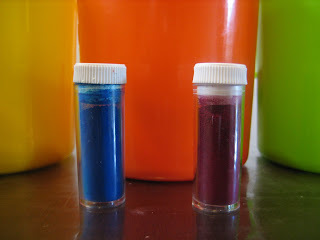 Put this on your just iced cupcake (if the icing is hard then this won't stick so well. Thanks Bobbie. I've gone in and made sure there were links to posts to links to post and posts to links etc etc. I think my head is spinning. Phew! It is a really good idea isn't it. So simple. I saw it in a book but they used it in a slightly different way and I can't wait to try it out.